Isometrics for Strengthening Tendons and Ligaments is one of the secrets of my incredible strength and one of the key reasons I resist injury, despite the heavy damaging workloads and stresses placed upon my body. If you're interested in becoming practically bullet proof to injury and want to unlock the hidden super strength lurking in your muscles then you'll want to pay close attention to this article. For many body-builders they want muscle size, and they achieve this by lifting heavy. They inevitably hit a point in their training where they reach the limit of their strength - they plateau and stall. There is a reason for this and a solution, I'll share both with you in a minute. Power-lifters want to be as strong as possible. And they also suffer this fate. Despite building a good foundation of strength, they stall. they hit a point where they cannot progress. It's frustrating. Sometime in the attempt to break past this barrier they are injured. the stories of year long and more set backs are too common in the world of strength. Some don't want to be power-lifters or body-builders. Some people just want to be in great shape and maximise their strength for daily life, their sports, or hobbies, or just to be able to enjoy time with their active kids. Some people just want to be free of injury and tired of the physio appointments that are getting no where. The Common Problem - What's your weak link? Each of these people have a common problem. They have neglected to strength their tendons and ligaments. They have failed to strengthen the connection of their muscle to their bones and their bones to each other. A chain is ONLY as strong as as it's weakest link and chances are your weak link are your tendons and ligaments. By strengthening these connective tissues you can unlock the true potential of the muscles, who are shackled by the limits of the tendons. Most of the time life changing injuries are caused by a tendon or ligament tear. Why Are Tendons and Ligaments So Important? Tendons and ligaments are essential in terms of resistance training and the cultivation of physical power. The tendon connects muscle to bone like a thick securing strap, that also can act like a muscle aiding in the contraction and extension of a joint, while stabilising it and making sure that joint doesn't slip out of place or that muscle tear off the bone. With proper training and development the tendons developed great elasticity and incredible power. It is the tendon that transmit load from the muscles to the bones and moves the body. And building your muscles too fast - without the training of the tendons, leave you without the full ability to call upon all your strength resources while leaving you susceptible to injury. The ligaments meanwhile are tough cord-like fibres with greater flexibility tying and binding our bones together at joints and allowing for movement in a specific direction. If you fail to strengthen these connective tissues, you're looking at serious injury with the typical tendon rupture taking nearly 50 weeks to recover from. Of course, we must have balance - strengthening the tendon's beyond the muscles will rupture the muscle, splitting the muscle belly itself. As such when looking to go beyond typical human strength - when questing to roll frying pans, tear phone books, balance your body weight on just your thumbs or life a man over head - you NEED strong tendons. Isometrics for Strengthening Tendons and Ligaments is the best way to build strength and prevent injury. By training the muscle and tendon's side by side in a progressive program you ensure you muscle and never limited by weak connections, and you muscles aren't threatened by overly tight tendons. The short range of motion (none actually) used in Isometrics loads the tendons as the muscles contract dispersing load equally. This is why so many high level body-builders, power-lifters and athletes Isometrics for Strengthening Tendons and Ligaments in sticking point training. But you can use this secret too. I have a 43 exercise Isometric Program that specifically targets this. It's called Samurai Strength Vol 1. Samurai Strength, while accessible to beginners is an advanced program. And the first volume focuses on a form of isometrics and training routines that focus on building the strength of your connective tissues - your fascia, tendons and ligaments. This has not been covered in my previous programs. These tissues have a lower blood supply and are not made up of FG fibres like the large muscle bellies we train in Perfect Body, Project Dragon etc, but they are very much needed for whole body strength and the prevention of injury. This is in fact one of the primary reasons that many athletes suffer muscle tears - in building up large bloated muscles they have failed to nourish their tendons and ligaments, they have failed to strengthen the connections between the muscles - and the kinetic chain, like any other, is only as strong as it's weakest link . Samurai Strength Vol 1 - Isometrics builds an unbreakable chain. You can see the results for your self and learn more about the program - here. But I don't want to leave you empty handed. 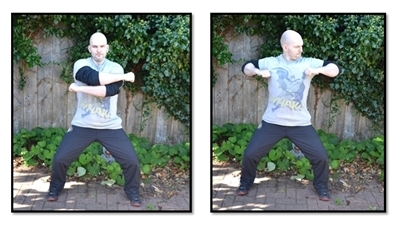 Here's one of the key exercises taught in Samurai Strength - its a whole body tendon, ligament and muscle builder. Our next exercise is going to be developing enpi - elbow striking. Very, very cool. You'll find it in an awful lot of martial arts styles including one of my base styles, Shotokan Karate. We're going to do dual enpi. 2. Bring your arms up shoulder level, fists clenched and palm facing downwards. 4. In this position perform a full body contraction as you breathe out making an "SSSSSSSS" sound for 7-12 seconds. 5. Relax and breathe in over 3-4 seconds, still maintaining a light round ball of abdominal tension. 6. Once finished without rising from the stance, chamber both fists on the hips.